Okay. So I just spent the last 4-5 hours cooped up in my room with this laptop while I sobbed, bit my nails ferociously to the stubs and screamed and squealed loud enough to possibly wake the rest of my family this late at night. All of this as I watched the final episodes of Iljimae. Let me start off by saying what I normally say: I wasn’t expecting this to be that great of a drama. After finishing Secret Garden, I had lost all faith that pretty much anything else could measure up to it, and settled on a random, completely impulsive last-minute choice, the historical action flick Iljimae. It was slow-moving, too action-packed, not enough romance, and pretty much just all around not appealing in the beginning, however, I saw the ratings, despite my questioning the first episode, and decided, if this much of South Korea loved it (it was #1 or #2 the entire time it was on the air) then I guess I can too. So, here’s the plot in a jist (with no spoilers that you don’t find out within the first few minutes): Joseon Dynasty (for those of you non-history buffs, just say medieval olden-days Korea) is the setting. Boy has nobleman father. Boy’s father is framed as a traitor and killed in front of him. Boy loses his memory. Boy is adopted by a peasant family. Boy grows up as a beggar, one day gets his memory back and embarks on a quest to avenge his father. Boy does this by dressing up as a badass Robin-hood-esque thief to search for his father’s killer. Boy becomes increasingly more badass as time elapses. Who is this boy? Well, he goes by three names: his birth name Gyum, his adopted name Yong, and his badass name, Iljimae. But I like to call him the amazing actor Lee Joon Ki, who I had not realized would ever end up as fantastic and lovely as he did. There comes a point when everything changes. All the things you may have hated are suddenly all wiped away and it becomes increasingly more intense, engrossing, suspenseful, heart-wrenching, and GOOD. Yong/Iljimae develops from an annoying little weasel to the hottest, coolest, strongest, most lovable character ever with his badass (honestly, I don’t feel I can overuse the word ‘badass’ enough here) character, who makes every scene more wonderful than the last. If you’re a sappy, over-emotional teenage girl like myself who NEEDS- and I mean NEEDS- romantic comedy to live, and cannot possibly imagine yourself enjoying a drama which is about 5% romance and about 95% crazy fighting, political conspiracies, and suspense, then change your mentality. Give this drama a chance. Lee Joon Ki, while unappealing at first, absolutely glows in this drama, and the characters seriously grow on you. This is an example of a drama which grows exponentially greater and greater as it moves forward. You become gradually more interested after each episode until you can’t pull yourself away. I’ve never watched so many episodes of a drama in a row before- I just couldn’t stop. And for those nerds out there like me who scout out soundtracks, this one has a goodie (I downloaded the ENTIRE thing). Give this drama a chance! And don’t let those words “historical” and “action” turn you away. 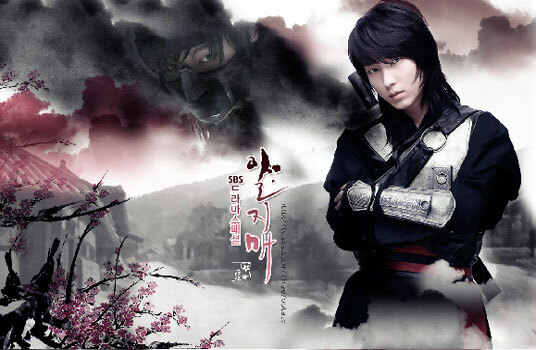 Much love to Iljimae, and my new favorite actor Lee Joon Ki ^_^ Annyeoung!